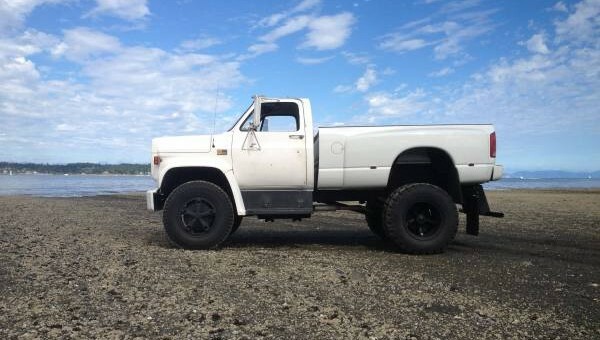 One foul-mouthed bloke up in Vancouver, Canada, wants you to know that he’s not compensating for anything with this Chevrolet C60 he’s posted for sale. He was very, very clear on that point. Thanks to Jalopnik for sharing this colorful Craigslist post. The truck itself is actually quite a peach; it’s a decommissioned 1981 Chevrolet C60 commercial truck, formerly a highway maintenance vehicle for the city of Vancouver. Everything from the 350 V8 with two-barrel carburetor, to the 5-speed manual transmission, is original – save for the bed. This being a commercial vehicle, the white, civilian-friendly pickup bed is a recent alteration, courtesy of the owner. Unfortunately, the body lines don’t match up, but the truck is still a decent-looking build. p.s.1 or 2 “opinions” have been sent via email.any “opinions” about my truck should be kept to yourself.dont [sic] talk on email,say it to my face.im [sic] not compensating for anything.ill [sic] show you what i got you city pu**y. Quite the offer. We think we’ll pass, thanks anyway. FYI, the ICD (International Classification of Diseases) uses the designation “C60” to refer to penile cancer. For whatever that’s worth. It’s actually a really nice looking truck, but I’d be scared some the owners douche bag would rub off on me.